JOHANNESBURG, July 27 (Xinhua) -- Chinese President Xi Jinping on Friday called on emerging market economies and developing countries to enhance cooperation in addressing common challenges. 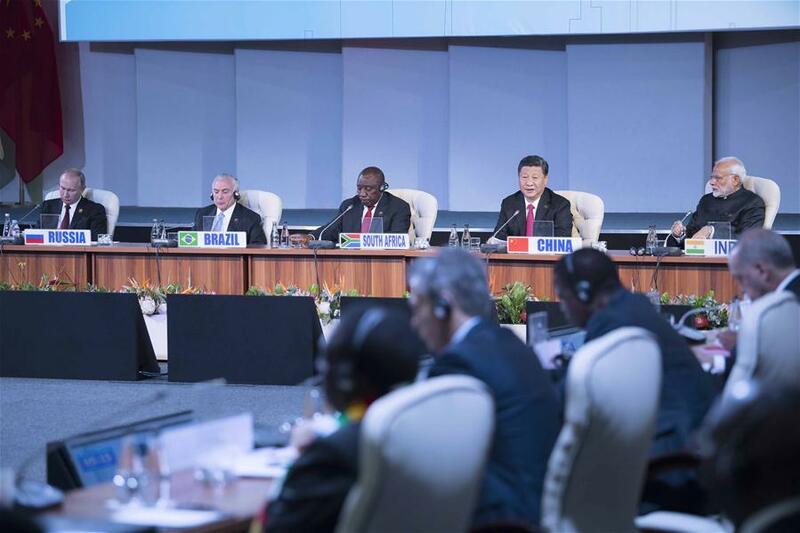 Xi made the remarks in a speech to an outreach dialogue grouping leaders from the BRICS, the "BRICS Plus" and African countries at the 10th BRICS summit here. The leaders discussed international development and cooperation, as well as the important cause of South-South cooperation, and reached broad consensuses. The world is undergoing great developments and transformation, during which emerging markets and developing countries are faced with shared opportunities and challenges, Xi said, stressing that it is increasingly important for them to enhance solidarity and cooperation. First, he said, the BRICS countries and their partners should jointly deepen their mutually beneficial partnership. We should understand, support, stay forever with and help each other, taking "BRICS Plus" cooperation as an opportunity to build an open, inclusive, cooperative and win-win partnership and create a platform for deepening South-South cooperation, said the Chinese president. Second, the BRICS countries and their partners should jointly explore new driving forces for development, Xi said. We should together seize the opportunity of the BRICS Partnership on New Industrial Revolution set up at this summit to take the high ground of development, and release our potential in complementarities and coordination, so as to achieve innovative, interconnected and inclusive development, he said. Third, the Chinese president urged the BRICS partners to jointly create a positive external environment, protect the multilateral trade regime, build an open world economy, continue to promote global economic governance reform, and strengthen the representation and voice of emerging market economies and developing countries. Fourth, we should build a new type of international relations together, firmly safeguard multilateralism, push the development of international order toward a more just and rational direction and implement the 2030 Agenda for Sustainable Development, Xi said. We should stick to the international development and cooperation model of regarding North-South cooperation as the main channel, and South-South cooperation as a complement, he said. President Xi stressed that it is significant that the BRICS summit was once again held in Africa, noting that we should take it as an opportunity to comprehensively deepen the partnership between BRICS and African countries. China and Africa have been good friends, good partners and good brothers, said Xi, adding that with joint efforts, the China-Africa comprehensive strategic cooperative partnership has developed rapidly, having formed a pattern of all-round, multi-level and wide-ranging cooperation that benefits billions of people. Regardless of how the international order changes, China will continue to maintain the policy of sincerity, real results, affinity and good faith and uphold justice and shared interests to continuously support Africa in achieving prosperity, he said. China and Africa will jointly hold the Beijing Summit of the Forum on China-Africa Cooperation in September. Xi said he is looking forward to meeting African leaders in the Beijing summit and called for injecting new impetus into the China-Africa comprehensive strategic cooperative partnership. He also pointed out that the development of socialism with Chinese characteristics has entered a new era, with China still being the world's largest developing country. China will stay as a developing country no matter how it develops, staunchly support the development of developing countries and be committed to building close partnerships, according to the Chinese president. We should pull together and work hand in hand to strive ahead advancing greater development for emerging markets and developing countries, he noted. Leaders invited for the dialogue commended the BRICS leaders for carrying forward the practices from last year's Xiamen Summit by conducting such a dialogue, saying it reflects the inclusiveness of the BRICS cooperation. They pledged support to institutionalize the dialogue and build extensive development partnerships in a bid to advance South-South cooperation. Under the current circumstances with the challenges of rising unilateralism and protectionism, all parties believe in the need to strengthen solidarity and cooperation between emerging markets and developing countries, promote development of cooperative partnership between the BRICS countries and Africa, enhance practical cooperation in various fields and jointly oppose unilateralism and protectionism, so as to gain inclusive growth, sustainable development and benefits to all. Besides Xi, other BRICS leaders, including South African President Cyril Ramaphosa, Brazilian President Michel Temer, Russian President Vladimir Putin and Indian Prime Minister Narendra Modi, and the leaders or representatives of the leaders from Angola, Argentina, Botswana, the Democratic Republic of Congo, Egypt, Gabon, Lesotho, Madagascar, Malawi, Mozambique, Namibia, Rwanda, Senegal, Seychelles, Tanzania, Togo, Turkey, Uganda, Zambia, Zimbabwe and Jamaica, as well as heads of regional organizations in Africa attended the dialogue.